Rare is it that I review a book from Mongoose Publishing and rarer still is it that I review a book for Traveller. Now do not get me wrong, I like Traveller and have had the pleasure of playing and reviewing many of the PDF releases of the last decade. For me Traveller is intimately entwined with the setting of the Third Imperium and its history, and as much as I want to revisit the game and its supplements, the one thing that prevents me from doing is its current publisher. If I am honest, I do not feel that this publisher does full justice to the game or its setting, they do not give it the love that another publisher might. Which begs the question, what I am doing reviewing a Traveller book if the last one that I read was infuriatingly dreadful? First off, I borrowed the book from a diehard Traveller devotee – thank you, Dave – and second, the reason that I am really reviewing it is because of its author, Martin J. Dougherty. As head of the collective that is Avenger Enterprises, Dougherty has written and published numerable titles for the various incarnations of Traveller, including scenarios, settings, and sourcebooks, through various publishers. In nearly all cases, the material has been interesting, entertaining, and when played, challenging and fun. 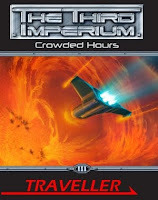 Four of Dougherty’s scenarios have been brought together in the anthology, Crowded Hours, which it turns out to be the last book that Avenger Enterprises will be releasing for Traveller through any publisher. Which is a pity. The four scenarios are in order, “Type S,” “The Windermann Incident,” “Crowded Hour,” and “Fiddler’s Green.” All are written around a disaster of some kind, with “Type S” and “One Crowded Hour” being more rescue orientated and “The Windermann Incident” and “Fiddler’s Green” being more combat orientated. Now whilst none of these scenarios are bad, each being highly detailed with plenty of background information, I will be reviewing them in ascending order of preference. So we start with “The Windermann Incident,” a convention style adventure set aboard an airship that gets hijacked. This is a cross between the movies Die Hard and Snakes on a Plane – or in this case, “Ferrets on an Airship” – and that about sums the scenario up. It comes with a set of pre-generated Travellers, all of them inspired by one action movie or another, some daft puns, and fifteen pages of quite possibly the worst deck plans ever published. The problem with the latter is that in their current condition, they in no way support the amount of space given over to describing the airship. “Fiddler’s Green” takes place on the Third Imperium client world of Bularia in Darrian subsector of the Spinward Marches which has been identified as the source of a new drug which is farmed there. The Travellers are employed to visit the world and sound out some farmers about the possibility of their dealing direct with an offworld pharmaceuticals manufacturer. This is a simple enough job, but it turns nasty when malcontents in the outback decide to take up arms and literally run everyone out of the region. Very quickly, this turns into a running gun battle as the Travellers, their hosts, and the surviving inhabitants make a run for it in the face of an enemy. “Type S” takes the Travellers to the world of Walston in the Bowman Arm of the District 268 subsector in the Spinward Marches where they are to locate, repair, and return a Type S Scout Cruiser, the appropriately named, Highndry. Getting there is easy, as is getting the location of the ship out of Walston’s recalcitrant inhabitants. They are happy enough for the Travellers to collect the ship, but first they must complete the task assigned to its previous crew – survey the volcano whose caldera it currently sits in! Getting to the ship means climbing the volcano in Walston’s thin air, but fortunately repairing the ship and carrying out the survey turns out to be reasonably straightforward and easy. Which should lull them into a false sense of security, because the volcano is far from extinct. Just being very, very quiet – but not for long… Just think Dante’s Peak with a spaceship, and you would not be all that far from the feel of this adventure. Top of the quartet in Crowded Hours is the scenario it draws its name from, “One Crowded Hour.” This is the only ship-set scenario and begins with the Travellers aboard a merchant liner heading for their next destination. In true roleplaying adventure fashion something goes wrong, in this case, the liner misjumps, and misjumps badly. In Traveller, a misjump is what happens when an interstellar journey goes bad, and usually it just means that the starship has travelled to somewhere other than the intended destination. In “One Crowded Hour” the situation is worse as both the crew and the Travellers must work fast to repair the ship, placate the passengers, and get everyone to safety in literally an hour. This is an intense scenario that is playable in an evening and delivers a fantastic playing experience. In terms of characters and skills needed, a good range is required. Mostly technical and ship-based in “One Crowded Hour” and “Type S,” but combative for “Fiddler’s Green” and “The Windermann Incident,” though a general range of skills would be useful for the last two also. Pre-generated Travellers are provided for use with “One Crowded Hour” and “The Windermann Incident,” though not the others, and in the case of “The Windermann Incident,” the pre-generated Travellers are cinematic in tone and feel. All four scenarios are highly detailed with full write-ups of their NPCs and come with plenty of background material – including Traveller’s traditional Library Data. Where necessary, they are also accompanied by appropriate deck plans, but in some cases more maps would have helped. For example, “Fiddler’s Green” is completely without maps and their inclusion would help a GM run the scenario. That all said, Crowded Hours is far from a perfect anthology, and the reason for that is due entirely to the physical appearance of the book. There is exactly one piece of artwork in the book, an illustration of an armoured car, which does no more than take up space in the book. This though, is not an issue with the book. It has plenty of space left over. The organisation of the book is dreadful essentially because all that the publisher has done is take the original scenarios as they appeared as PDFs, and place them one after the other, renumber the pages, and bound them in the hardcover format. Beyond, there has been no attempt to edit this book. So you get the same introduction to Avenger Enterprises four times and the same background to the Third Imperium four times. Worse, nearly all of the maps and deck plans have been very poorly reproduced, in the case of the airship in “The Windermann Incident,” to the point at which they are useless. The result of this is twofold. First it makes Crowded Hours feel cheap. Well actually cheaper, because being a black and white hardback book for $40 actually makes Crowded Hours feel cheap already. Second, everything bar the contents of each scenario, everything about Crowded Hours feels unprofessional. Crowded Hours ends with an epilogue in which Martin J. Dougherty announced that the anthology would be the last Traveller title from Avenger Enterprises. This is a shame, because not only is this an excellent collection of adventures, but because the collective has released some very good titles over the years. Yet it is understandable. After all, if your writing was being so poorly treated as shown in this book, would you continue working with a publisher that has so little regard for your work? Still if you are looking for four detailed and well written scenarios for Traveller, this anthology would be an excellent choice. 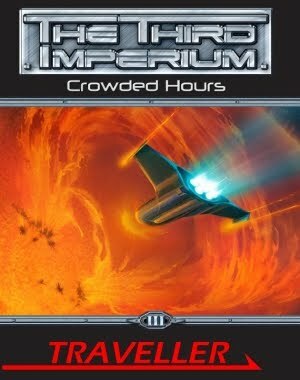 Indeed, any of the four scenarios in Crowded Hours would work with almost any Science Fiction RPG, from the Margaret Weis Productions’ Serenity Role Playing Game and Rogue Games’ Thousand Suns to the FATE powered pair of Starblazer Adventures: The Rock and Roll Space Opera Adventure Game from Cubicle Seven Entertainment and Diaspora from VSCA Publishing. I have to say that I think you're being a bit harsh on Mongoose here. I say this not as a Mongoose fanboy as I am still a CT player (although I am impressed with the way that the Mongoose system fixes a lot of flaws in CT). I have not read Crowded Hours so can't comment on this particular product, but your criticism is about the Mongoose range in general. I agree with you that there are often flaws in Mongoose products but, what they lose in quality, they more than make up for in quantity. Personally I would rather have 200 pages of info in a book with the occasional spelling mistake or bad scan than 40 pages which are absolutely perfectly edited and typeset. For example, the party in my campaign recently misjumped into the Vargr Extents and I needed to cram up on Vargr for this section of the campaign. I have the Vargr supplements for CT, MegaTraveller and GURPS Traveller which I looked through, but Mongoose Vargr contains three or four times as much information as any of the other versions. With GURPS' license expiring later this year, would it really be better for Traveller if there was no one left to keep Traveller alive? To be honest I would rather have quality rather than quantity and the professional than the slipshod, with material authored by those that know the setting. The last product I purchased for Traveller was one of the worst RPG supplements ever published and I do not make that comment lightly. The likelihood of my buying another Traveller book from Mongoose Publishing, let alone any book from the publisher, is very, very low. I agree that this true of Classic Traveller, but later iterations of the game were very closely tied to the setting of the Third Imperium. So a game and its setting are not always two different things, and in my experience, this is so with Traveller. We always played Traveller in the Third Imperium, and if we wanted to do another Science Fiction game, we used another set of rules. Apes and Dragons, Oh My!